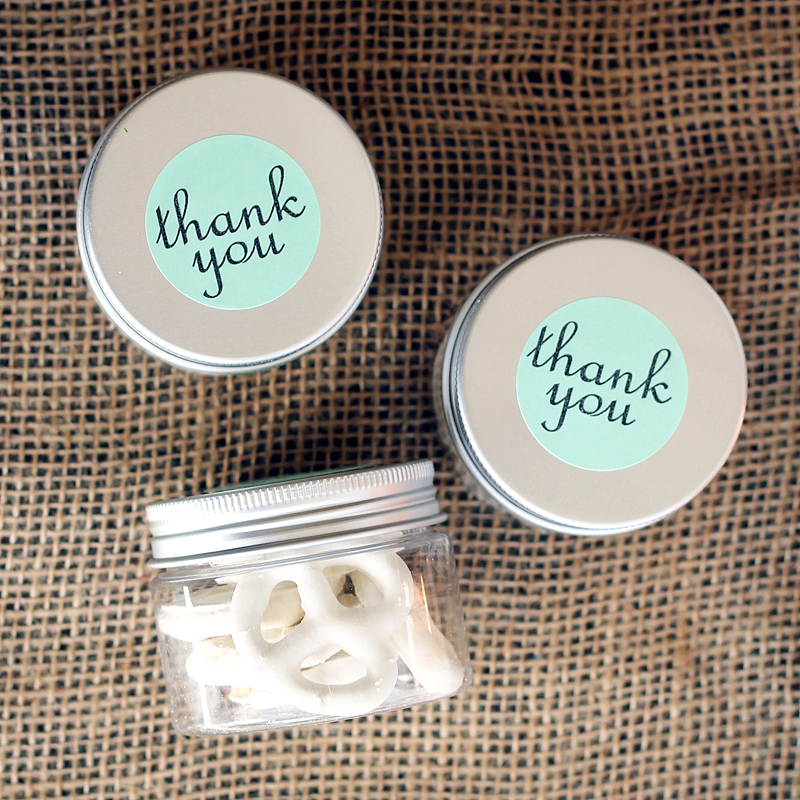 Wedding favors in jars can be a great addition to your wedding. 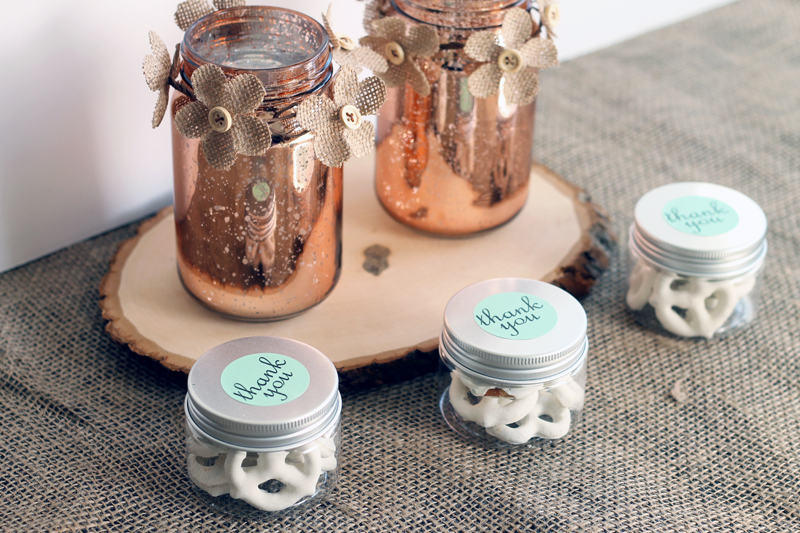 We are kicking off mason jar wedding week with some favors that will work perfectly at your wedding reception. This post is also sponsored by Online Labels however all projects and opinions are my own. 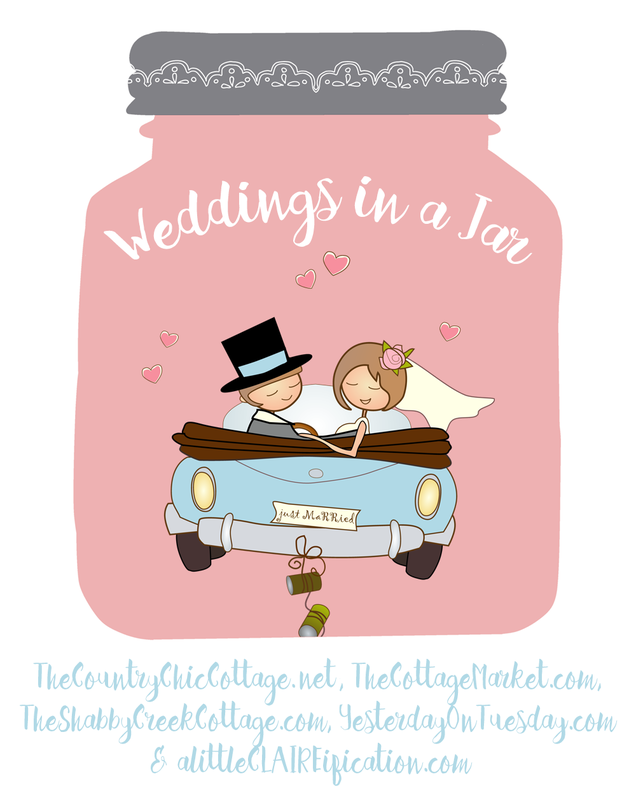 Stay tuned all week for great mason jar wedding ideas and don’t miss the ideas for today from my blog partners at the bottom of this post. You can print the labels on your home printer easily. 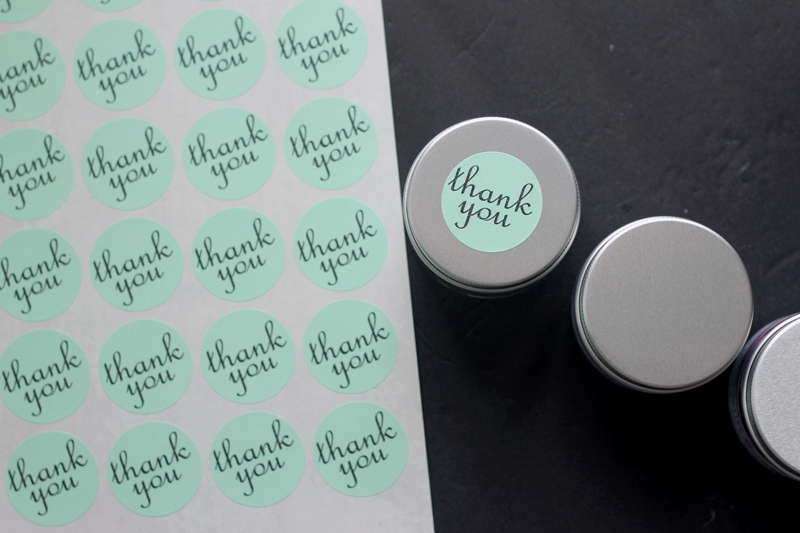 Be sure to purchase plenty of the labels because these will be perfect for thank you cards and more! You will use several sheets I am sure. Peel and stick the labels to the top of the plastic containers. 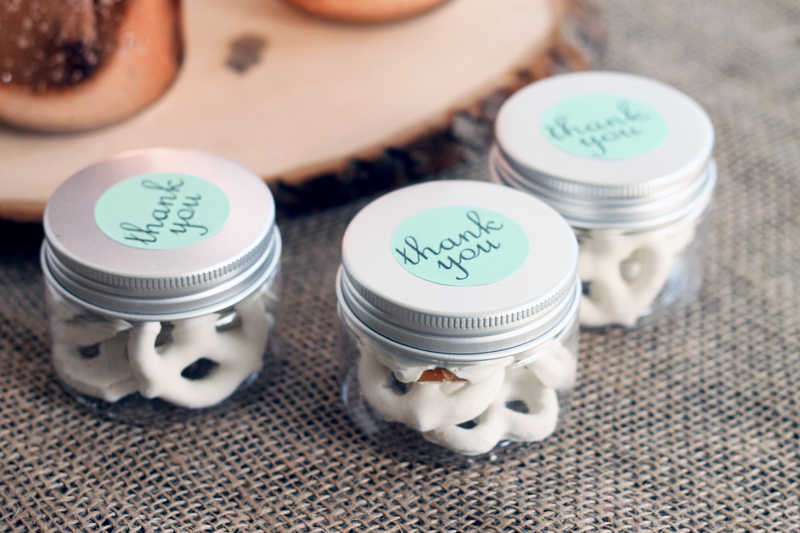 I love these mini plastic jars for wedding favors! You will not have to worry about anyone breaking the jars but you can still get that great mason jar look. Fill the jars with the favor of your choice. Mints, chocolates, almonds, and more will work. We used chocolate covered pretzels in our wedding favors. Set these out at your wedding reception and let the guests pick up their own fun little gift in a jar. We love them next to our copper mason jar centerpiece! Stay tuned later this week to see how to make that one! 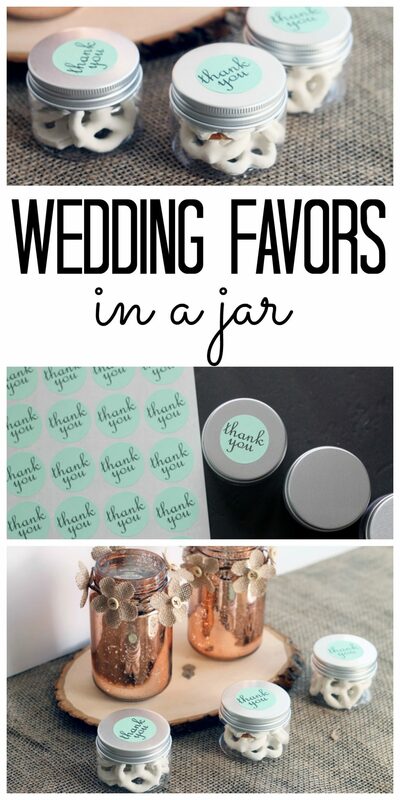 If you love this idea for wedding favors in jars, you will love what my blog partners for mason jar wedding week have in store for you! Click around to each blog to see the mason jar wedding ideas. previous post: Easter Desserts – 20 ideas for you! 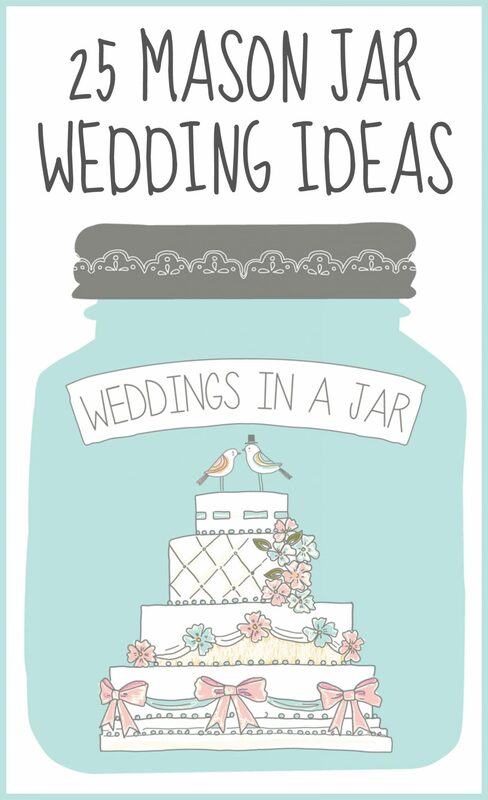 Adorable little jars & idea! So sweet and simple – I love the pastel green too! These are a fun idea! I can’t wait to see what the rest of the week brings! 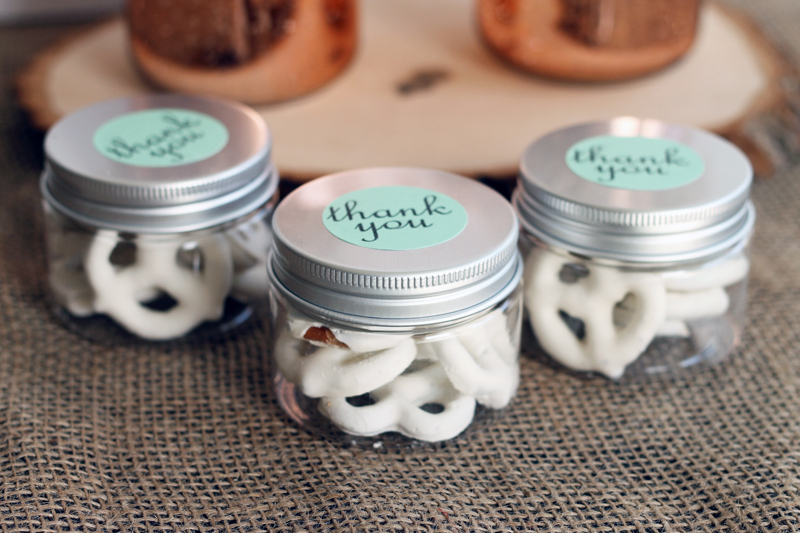 Love the simplicity and the mason-jar look for these super-cute favors, thanks for sharing. Stopping by from the Making A Home – Homemaking link party. Mason jars are still hugely popular because of their simplicity, ease of use and so many fun things you can fill them with. I’ve repined the pic with the copper jars, as copper is the up and coming metallic color so many brides are looking for. Can’t wait for the tutorial to explain how to make the copper centerpieces – they look like mercury glass, so pretty! What a cute Idea. Those are perfect. These are so cute! I could see myself doing this for a bridal or baby shower too! Thanks for sharing on the Small Victories Sunday Linkup! Sorry! I do not sell these I only show you how to make them.